Marianne Frances Fischer, (nee Mitchell), of Tinton Falls, NJ, formerly of New Milford and Harvey Cedars, NJ and Southport NC, passed away peacefully on November 22nd surrounded by family. 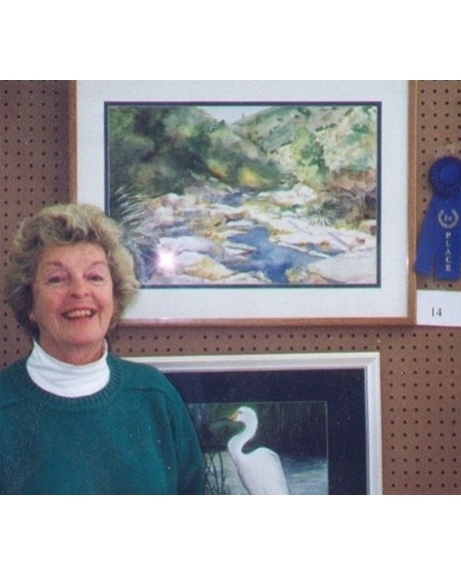 She was a loving wife and mother and a talented artist, a signature member of the North Carolina Watercolor Society. She is predeceased by her husband of 63 years, Frederick, and her sister Margaret Dellatorre. She is survived by her sons Frederick, Jr and his wife Mary of Waldwick, NJ, and Kenneth and his wife Mary of Boston MA, and her daughter Marianne Fischer of Riverdale, NY, her brother Al Mitchell of Hamden CT and her loving grandchildren James, Abigail, Elizabeth and Christine. Family will receive friends and relatives from 4pm to 8pm on Tuesday November 27th at Feeney Funeral Home, 232 Franklin Ave, Ridgewood, NJ. A funeral mass will be held at St. Luke’s R.C. Church, HoHoKus, NJ at 10am on Wednesday, November 28th. In lieu of flowers please send donations to Villa Marie Claire Hospice, www.villamarieclaire.org.